A stunning seventh-wicket stand between Ravi Bopara and Paul Nixon almost brought England a sensational win but they fell two runs short in Antigua. 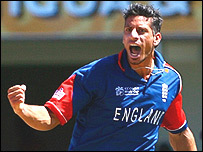 Sajid Mahmood and Andrew Flintoff took seven wickets to bowl Sri Lanka out for 235, Upul Tharanga (62) top-scoring. In reply, Kevin Pietersen (58) and Ian Bell (47) did well before both fell. England were reeling, but Bopara (52) and Nixon (47) put on 87 to give their side a hope, only for Dilhara Fernando to bowl Bopara with the final ball. It was a sensational ending to a tense affair, and was cruel luck on Nixon and especially Bopara, whose maiden one-day half-century counted for little in the end. Michael Vaughan had said before the match that England's World Cup started here, and their efforts in the field certainly displayed a renewed vigour. After winning the toss and electing to field, Vaughan watched on as Mahmood and James Anderson enjoyed some early movement that helped both pacemen beat the bat. However, Jayasuriya, who became the highest-capped one-day player in history in the match with 385, was looking in ominous form after a couple of early scares. The opener thrashed four sublime fours before hooking Mahmood off a top edge for six, and the relief amongst the England fielders was palpable when he played on off a sharp delivery from the Lancashire paceman to fall for 25 off 22 balls. That brought Kumar Sangakkara (17) to the crease, but Sri Lanka's strangely subdued tactics continued and he had only driven two fine fours when he fell to a Mahmood slower ball, dollying a catch to backward point. Sri Lanka's tactics were clearly to keep wickets in hand and, with Tharanga scoring runs at a pedestrian rate, it was hard to determine who was happier with the modest run rate. Tharanga brought up his 50 off 91 balls, scoring just one boundary in that time, and his task was clearly to see the innings through but he mis-timed a pull off Flintoff to succumb and Jayawardene followed soon after. The captain's slog-sweep off Collingwood (1-44) found Ed Joyce in the deep to fall for a 61-ball 56, which included four boundaries. Suddenly, Sri Lanka's lack of urgency looked like it might prove problematic - and when Ian Bell produced a superb run-out to dismiss Tillakaratne Dilshan, they were 193-5 in the 43rd over. The pressure was on Russel Arnold and Chamara Silva to take Sri Lanka over 250 but, two fine boundaries aside, Silva could not provide the necessary impetus and Flintoff yorked him to end his 37-ball 24. Chaminda Vaas, Lasith Malinga, Arnold and Fernando all fell cheaply in the closing overs with Flintoff (3-35) and Mahmood (4-50) wrapping up the innings for a miserly 235. The total appeared 30 to 40 runs shy on a good pitch, but England's self-congratulation on a fine fielding performance was short-lived when both openers fell in the first six overs of their reply. Vaughan might consider himself slightly unlucky that he was given out caught behind off Vaas, with replays unclear on whether the ball had hit bat or thigh pad, but there was no doubting Joyce was plumb in front to Malinga. However, Pietersen and Bell calmed any nerves - the odd run-out chance aside - with a series of cultured, and sometimes brutal, shots. 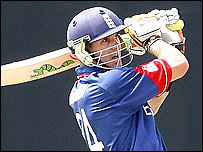 Pietersen in particular looked in the mood and he struck five fours and a glorious straight drive as he negotiated first the pacemen, and then the gentle spin of Jayasuriya and Dilshan. Bell also recovered from a shaky start to play some characteristic cuts and leg-glances and England passed 100 without too much alarm, so much so that Jayawardene delayed taking his third powerplay. However, when Bell fell in the most unfortunate fashion - Jayasuriya deflecting Pietersen's straight drive onto the stumps after Bell's bat had bounced off the crease - England began to wobble. It was the 14th time in his one-day career that Bell had got out in the 40s, but Pietersen has been equally guilty of failing to make the most of starts of late and so it proved again. Jayawardene took the final powerplay and Muralitharan, who was bowling excellently despite suggestions of a groin injury, deceived the number four with a doosra and collected the return catch. Flintoff, caught by Malinga in the deep, and Collingwood, lbw, then fell within three Fernando deliveries to leave England reeling. The Sri Lanka captain's plan had worked perfectly and, with the run rate climbing, even Bopara and Nixon's dogged resistance did not look to be enough. However, that was reckoning without a sensational rearguard effort from the pair, who put on 87 outstanding runs from 15.2 overs. Four fours and a six interrupted a host of ones and twos, with Nixon reverse-sweeping and Bopara ekeing runs out from all around the wicket. With 16 needed from eight deliveries, Nixon chanced his arm but could only sky it to Jayawardene off Malinga to fall for 47. Every run was precious and Bopara sliced Malinga to the point boundary to leave England needing 12 off the last six balls. 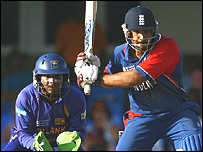 Fernando (3-43) took the final over and when Bopara clipped him over fine-leg for four, the impossible looked on the cards, only for the seamer to bowl the Essex all-rounder with the final delivery of the match - from which three runs were needed for victory - to secure a thrilling win for Sri Lanka.